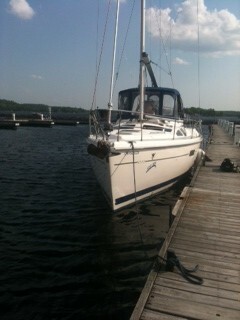 Hmm… the trip from Killbear Marina to Bob’s Point (in Parry Sound) went fairly well. It was interesting though at the very beginning as soon as the boat was launched. The water level in Georgian Bay has gone down considerably in the past year. The Split Crow draws 5 feet of water and there was only 4 foot 8 at the dock as well as in the channel leaving the marina. Luckily, the depth metre is not that accurate! Dennis motored the boat by himself from Killbear to Parry Sound – the sails are still down below in the cabin. We are waiting for a calm day to set them. Once out of the channel, he put the boat in auto-pilot (which actually worked!) and went down below to check the engine. There were a couple of problems but he continued motoring on because the engine seemed to work. Once Dennis arrived at Bob’s Point, he found out the various things that needed attention. The impeller (whatever that is) was all chewed up, so he bought a new one and installed it. That was fairly straight-forward. The other problem though was that the transmission was leaking water (sorry if I am unclear in this) and he spent a couple of hours trying to repair and replace the important O ring. His hand got mangled in the process – and now has this big red patch on it – I think he said that he got his hand twisted in the engine somewhere. After spending several hours on the transmission, he gave up and come home to think it over. He’s back at it this morning with a new solution – something to do with crazy glue – I think he is going to cut the O ring, crazy glue and stick it back on the leaking transmission part. We will see if this works. Apparently, there was a problem before we owned the boat because someone else had previously worked on the same thing. The other interesting problem is that a mouse somehow got into the cabin over the winter and left all sorts of parcels. I can’t imagine how it got in and I keep expecting to find its body but so far I haven’t. Dennis thinks that it must have gotten out because we had no food on board. I hope so. This has motivated me to clean the boat though and as soon as it is put back together, I will get on it. So, good thing Dennis is handy – I am sure he really enjoys these mechanical puzzles. I said that when we actually leave, the boat will have no room for luxuries such as food because we’ll have to fill it with spare boat parts. PS – the wind metre still works!